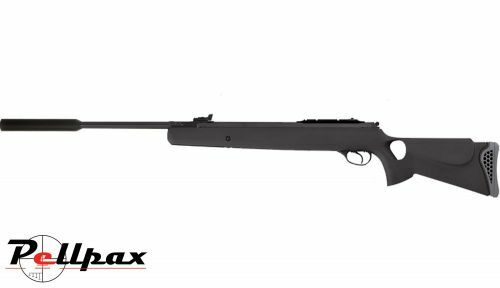 The Model 85 Thumbhole air rifle from Hatsan is an exclusive model for the UK, featuring a full power action in .22 calibre, along with a black synthetic thumbhole stock for precise and accurate shooting. Also adding to the specification on this fine Hatsan air rifle is the large factory fitted sound moderator to reduce the muzzle report, as well as aiding in the cocking of this rifle. It can be removed though, if you should so wish. The Precision rifled barrel provides excellent accuracy at both close, and long ranges. The action has an auto cocking safety and manual resettable safety to ensure that the rifle cannot be discharged when the barrel is open, and won't be until you're ready. There is a 9-11mm scope rail grooved into the receiver with a mounted scope stop to eliminate any scope movement, and the rifle does not have any open sights so make sure you purchase a scope to make the most of this rifle. Add this item to your basket & spend an extra £240.01 to apply for finance.